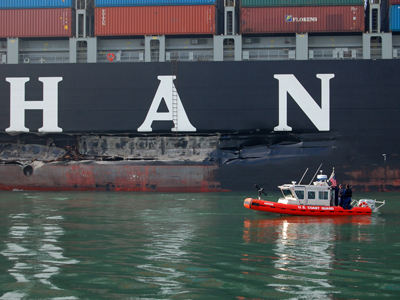 SEPTEMBER 21, 2011 -- The infamous fog of San Francisco was thick and gray the morning the Cosco Busan cargo ship crashed into the San Francisco-Oakland Bay Bridge. It was November 7, 2007, and within seconds of the crash, 53,000 gallons of fuel oil were released into the surrounding waters. One of the largest oil spills in the history of San Francisco Bay, it set into motion a series of events that ultimately led to the recent historic $44.4 million settlement [PDF] with the companies responsible for the spill (Regal Stone Limited and Fleet Management Limited). To the public, this $44.4 million means there will be money for bird, fish, and habitat restoration in the bay. It will enhance shoreline parks and outdoor recreation throughout the Bay Area, helping compensate the public for the lost visits to the beach when oil washed up on the shores. This settlement will resolve all outstanding legal claims for natural resource damages, paying for the damage assessment, remaining cleanup costs, and for restoration of natural resources from the spill. That first morning, we didn't really know how much oil had been spilled—initial reports indicated it was only a small amount. But as the fog lifted, it quickly became apparent that oil was spreading over a large expanse of the bay. 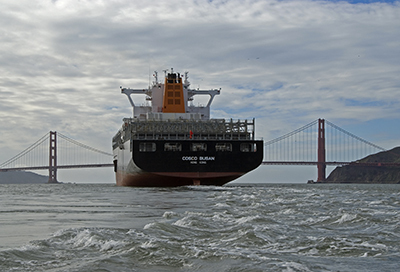 For the next several weeks NOAA scientists worked long hours to quickly organize and conduct the field work to evaluate natural resource damages from the Cosco Busan oil spill. As the thick bunker oil spread on the waters surrounding San Francisco, it turned into tarry patches and balls that eventually stranded along hundreds of miles of shoreline. Much of our understanding about the toxic effects from oil spills comes from studies of crude oil, conducted after the 1989 Exxon Valdez spill. But as we studied the effects of bunker oil on fish and wildlife after the Cosco Busan spill, we discovered bunker oil not only behaves differently than crude oil in the environment, but it appears to have different toxicological effects. Two to three months after the spill, when the huge annual schools of Pacific herring entered San Francisco Bay to find their shallow spawning grounds, most of the evidence of lingering bunker oil was already gone, either cleaned up or weathered away. But when we collected herring eggs from areas both affected and unaffected by the spill, we made a remarkable discovery: Almost all of the eggs collected from spill locations were dead or deformed. The eggs collected outside of the spill zone were largely normal. This was especially surprising given the lack of significant remaining evidence of bunker oil. We conducted additional studies over two more seasons of herring spawning in the bay and eventually concluded that the toxic characteristics of the bunker oil from the Cosco Busan spill affected as much as a quarter of the herring spawning in 2008. We also concluded that the effects didn't carry over past that first spawning season after the spill. Our studies, directed by scientists from NOAA's Northwest Fisheries Science Center and the Bodega Marine Laboratory in California, forged new scientific understandings on the effects of oil spills on aquatic resources and will guide further progress on our assessment of present and future spills. Find out more about the natural resource damage settlement by listening to this National Ocean Service podcast and reading the natural resource trustees' press release.